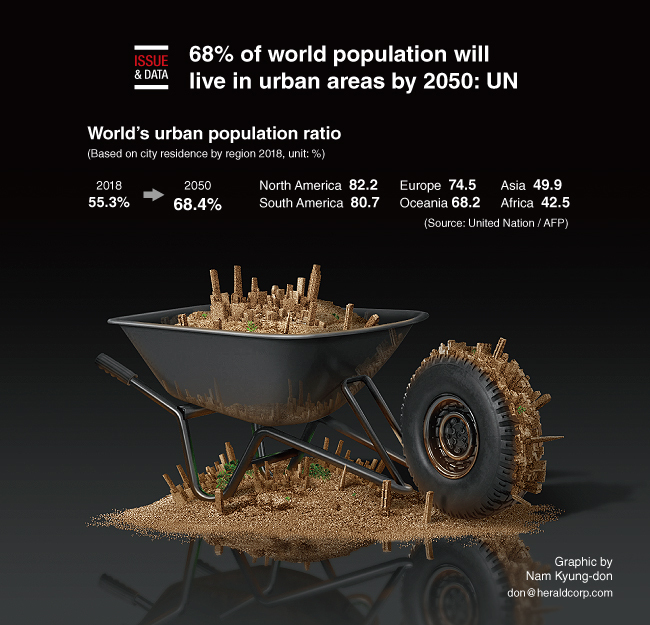 Sixty-eight percent of the world‘s population will live in urban areas by the year 2050, the United Nation said Wednesday, up from the current 55 percent. The UN report predicted an extra 2.5 billion people living in ever-expanding cities in the next 30 years, with as much as 90 percent of the urban growth centered on Asia and Africa. The boom in city-dwellers will be concentrated in certain countries, with 35 percent of urban expansion occurring in India, China and Nigeria alone between 2018 and 2050. That will add up to an extra 416 million people in towns and cities in India, 255 million in China and 189 million in Nigeria. The most urbanized regions include Northern America (with 82 percent of its population living in urban areas in 2018), Latin America and the Caribbean (81 percent), Europe (74 percent) and Oceania (68 percent). The level of urbanization in Asia is now approximating 50 percent. In contrast, Africa remains mostly rural, with 43 percent of its population living in urban areas.